Choosing the right electric fireplace for your room can be tough. From traditional logs to contemporary fire glass, wall mounts to entertainment centers, and crisp white to classic wood, there is an electric fireplace to fit each room decor. Browse our photo gallery to get inspired on how to incorporate an electric fireplace into your home! Wall mount electric fireplaces save valuable floor space while giving you a moving work of art in your room. Wall mounts can be hung or recessed and can be installed anywhere including your living room, bedroom, bathroom, kitchen, and home office. Shop all wall mount electric fireplaces here. Built-in electric fireplaces also save valuable floor space by being built into an opening in your wall. These create a permanent fireplace and require professional hardwiring, so suggest a built-in electric fireplace only if you own your home and are not renting. Shop all built-in electric fireplaces here. Electric fireplaces mantels are the perfect solution if you like the look of a traditional fireplace. There are several options of electric fireplace mantels including stone, traditional wood, and modern white finishes, with media options of logs, embers, and fire glass. 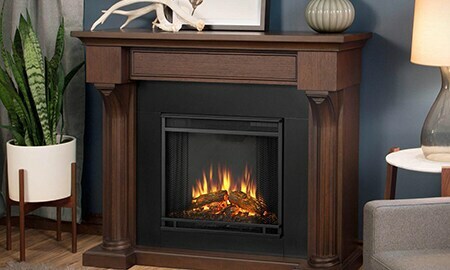 Shop all electric fireplace mantels here. Electric fireplace entertainment centers are a great option if you want the ease and convenience of an electric fireplace with added functionality. By choosing a media console, your electric fireplace provides décor, warmth, and storage for your room. Shop all electric fireplace entertainment centers here. Many traditional mantels, entertainment centers, and even wall mount electric fireplaces come in white finishes so you can choose the best style for your aesthetic. The convenience and ease of white electric fireplaces allow you to keep the integrity of your room’s design without sacrificing warmth and functionality. Shop all white electric fireplaces here.